Everyone always asks me how I make these, so here goes. These are super cheap and easy to make. At the Dollar Tree, on the aisle with the flowers and frames and other various crafts, you will find a roll of green florist’s tape. So, grab a roll of that, a flower bunch, and a package of pens from the stationary aisle. Unroll 10 inches of tape and cut. It will not be sticky yet, so don’t freak out. Set aside. Cut the flower off the large stem, leaving about two inches of stem on it. Hold your flower against the end of the pen with one hand. 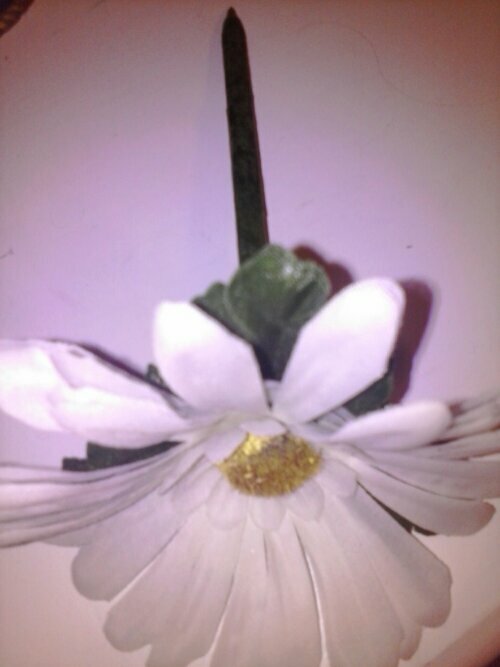 With the other hand, pick up the piece of tape you cut off and place over the flower portion of the pen. Now, stretching the tape, (this is what makes it become sticky), wind it around the pen and flower all the way down the pen. Cover all but the tip of the pen. If you have too much, wind it back up the pen. If it is sticky on the outside and not so much the inside, you put the tape on upside down. Don’t fret, just take the tape off, throw the tape away and cut another piece. It seems like this tape will never run out. Over time, part of the pen may get worn out. Just cover with more tape as needed. When we ran out of carpet powder, I thought, “man, I spend a lot on powder. I bet there is a way to make my own.” Then I found this recipe. It called for a parmesan cheese container to shake it out of. But, as long as you have the capability to sprinkle it on the floor, I don’t see a problem in it. Mix both in a container with a lid. I shook mine up. All done! When ready to use, sprinkle on your carpet and let it site for about 15 minutes, then vacuum up. Sweet smelling victory. So, you know how when you buy those feathers on a string that are supposed to clip into your hair. I bought a few because I thought they would look cute and ended up getting them tangled in my hair. The string came attached to an open clip that just didn’t close. So, here’s how to get them to work for you. Go to the dollar store and get some barrettes. 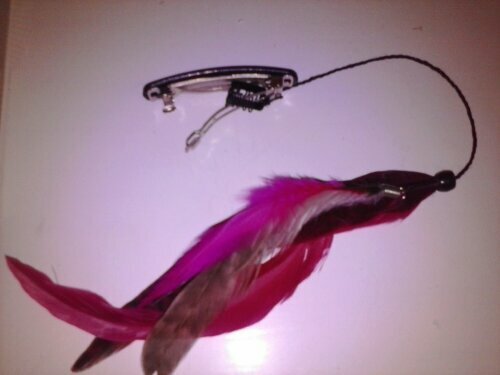 Open one up and slide the feather clip onto it and close it. I bought enough barrettes to equal the among of feather clips I bought so I don’t have to keep taking them on and off. Hope this helps. Put a tiny bit of toothpaste into a small cup, mix in one teaspoon baking soda plus one teaspoon of hydrogen peroxide, and half a teaspoon water. Thoroughly mix then brush your teeth for two minutes. Remember to do it once a week until you have reached the results you want. Once your teeth are good and white, limit yourself to using the whitening treatment once every month or two. Did you know that vinegar and Dawn dishwashing detergent makes the best cleaning fluid? Here’s a trick I’ve figured out that helps me a ton. I absolutely hate cleaning showers and tubs. You have to get down on your knees, and mine hurt, and you’re stuck there for a long time scrubbing and scrubbing. So, I figured that if I could find a way to clean the shower without getting on my knees I would try. I originally bought a dishwashing wand at the dollar store. Big mistake. Everything ran out of it. I definitely recommend buying the name brand one. So, you pay more, but it works and lasts a long time. Scotch makes the best one. Fill it half with vinegar, then half with Dawn. This must be brand name as well. Cap it off and shake well. I put mine in the shower caddy sponge side up. When ever you shower, just turn it over and scrub away. It doesn’t take near as much scrubbing and I’m just bending over to scrub. I scrub the shower every other time I shower and find that it works great. Do you own a swiffer dust mop? Then why are you buying those expensive pads for them? They are high priced and if you buy the generic ones, they don’t work. Well, there is a solution. And believe me it’s too simple. Grab a couple old washcloths or wash rags. Or better yet, crochet a square that fits around the flat end of the mop. For a duster, simply take a rag and drop a bit of fabric softener on it. mash it around a bunch and allow to dry completely. Once dry, and this may take a day or so, wrap around your swiffer and press into the holes and dust. For a mop, simply take a rag and get it wet with hot water. 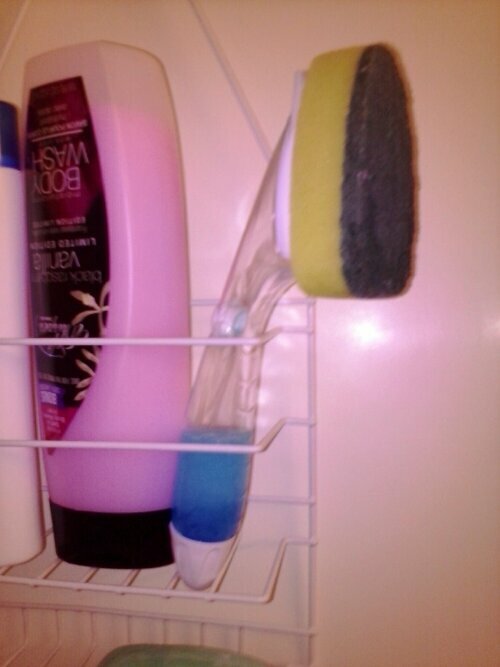 Spray some soap of your choice over it and mash it together. Ring it out, but not all the way. The rag must be wet. Mop away. I’ve even had to add water to the rag as I go. This dries pretty quick. A how-to on how I made this dresser look so good. It was a dresser that was given to me and had stickers all over it. I used the mayo method to remove the stickers. Then, I took the drawers out of my dresser and painted the dresser white with flat paint. This took several coats. 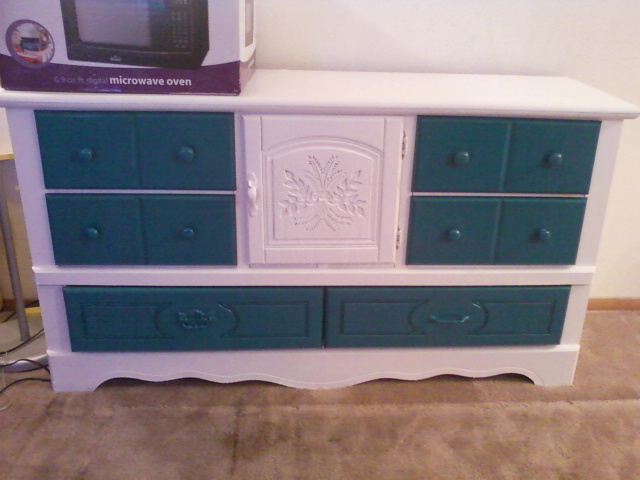 I painted the drawers a turquoise using a sateen spray paint. Then I bought a mirror from the thrift store, taped paper over the mirror part, then used the turquoise paint again to paint the wooden sides of the mirror. Shown is the dresser.